By Tom Harris and Madhav Khandekar - posted Monday, 25 November 2013 Sign Up for free e-mail updates! For many years, our representatives to the United Nations climate conferences have behaved as if they could make dramatic, headline-grabbing commitments without serious long term consequences. Perhaps they hoped people would forget about their agreements as the years went by and other pressing issued arose. Or maybe they assumed they would no longer be in office when the impact of their decisions would be felt. The UN climate conference in Warsaw, Poland over the past two weeks has clearly demonstrated that their chickens are finally coming home to roost. UN delegates are actually being held accountable for the climate change problems which those representatives years ago claimed the developed world to be causing. Developing countries are now demanding that we have an obligation to pay them trillions of dollars for loss and damages, since much of the extreme weather and other problems they are experiencing are supposedly our fault. Logically, morally, and perhaps even legally (though not scientifically), developing nations have a solid argument. It would indeed be inconsistent with the normal standards of law and ethics as observed in most of the world if we did not compensate those affected by our misdeeds. So in unjustifiably accepting the blame for climate change, and the extreme weather, rising sea levels, species extinction, and other calamities that climate change supposedly causes, our representatives set us up for the dilemma we now face: pay up, or risk the wrath of much of the world for irresponsible and possibly criminal behaviour. The problem started in 1992 at the Rio Earth Summit, where representatives of nearly every nation agreed to the UN Framework Convention on Climate Change (FCCC). Under the Framework, which was eventually ratified by the governments of 195 countries, developed countries promised to "take the lead in combating climate change and the adverse effects thereof." The FCCC's "ultimate objective" was nothing less than "stabilization of greenhouse gas [GHG] concentrations in the atmosphere at a level that would prevent dangerous anthropogenic [human-caused] interference with the climate system." "It is not possible at this time to attribute all, or even a large part, of the observed global-mean warming to (an) enhanced greenhouse effect on the basis of the observational data currently available." "I am happy to report that I have just signed the Framework Convention on Climate Change. Today, I invite my colleagues from the industrialized world to join in a prompt start on the convention's implementation…. Let us join in translating the words spoken here into concrete action to protect the planet." 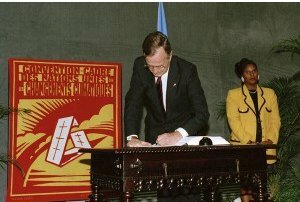 President Bush signs the UN Framework Convention on Climate Change in Rio, June 1992 (Source: UN). Since then, the FCCC has been the source document upon which the Kyoto Protocol, the Cancun Agreements that form the basis of current negotiations, and all other UN climate agreements have been based. Even the IPCC science reports were whipped into line, each one claiming greater and greater certainty that humans were the main cause of global warming. 'The science is settled' became the new mantra. Finally, at last year's round of UN climate talks in Doha, Qatar, developing nations began to push hard for developed countries to pay for "loss and damage" caused by extreme weather events supposedly caused by our historic GHG emissions. Negotiators from developed countries balked, and the conference was on the verge of breaking down over the issue. "There is medium evidence and high agreement that long-term trends in normalized losses have not been attributed to natural or anthropogenic climate change." Instead, our inept representatives agreed with the demand, promising to put in place "institutional arrangements" in Warsaw in 2013. "We are not going home without a loss and damage mechanism [within the FCCC]! They [developed countries] cannot postpone this forever and ever." Representatives from developing countries asserted that adaptation efforts are overwhelmed by the supposed increase in extreme weather events, and so the FCCC must therefore address loss and damage as a standalone issue. "in no case has a convincing relationship been established between warming over the past 100 years and increases in any of these extreme events." They could have then helped educate conference delegates by explaining that the number of tropical cyclones making landfall in the Philippines has not changed in over a century. 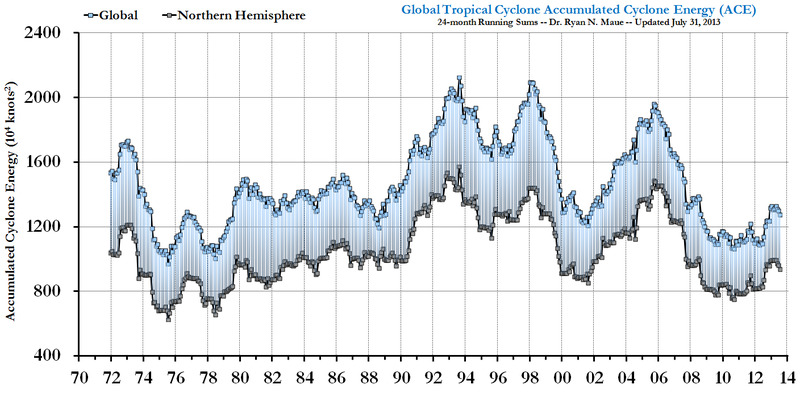 Globally, we are near a 30 year low in worldwide Accumulated Cyclone Energy, a measure of total cyclone activity. Instead, our representatives let us down again. They resorted to the weak argument that loss and damage should be part of adaptation to climate change, already enshrined in the FCCC process, and that no new mechanism is needed. "I think the third world and others are entitled to know that the commitments made are going to be commitments kept." He was right. It's time to stop playing games with the poor of the developing world, admitting to guilt for natural events we do not cause and making ridiculous promises we have no intention of keeping. Our representatives must start telling the truth about climate change and extreme weather, namely that tropical cyclones and other extreme weather events will continue to happen no matter what we do. Instead of wasting money trying to stop them or blaming human activity as their cause, we need to help people prepare for them. A tropical cyclone of about same intensity as Haiyan struck the east coast of India near the state of Orissa about a month and half ago. Only a couple of dozen people died for one very simple reason: the Government of India was properly prepared, having learned their lesson from the tragic deaths of over 5,000 pilgrims when heavy rains and land slides struck the country in June. The Indian Met office had warned the state government to postpone the pilgrims' march to a special temple in the mountains, but officials ignored the warning and catastrophe ensued. So this time, when the tropical cyclone was seen approaching India, both the state and federal governments responded properly, evacuating about 100,000 people, resulting in relatively few casualties. If the Philippines government had done the same, and had their storm shelters been properly constructed, the death toll from Haiyan would have been much lower. A similar typhoon struck Australia in 2011, a country which does have proper storm shelters, and there were no fatalities. At UN climate conferences, adaptation and preparation for climate change takes a distant second place to attempts to stop what might happen decades from now. This backwards approach is happening all over the world. According to the October 2013 report of the Climate Policy Initiative, of the approximately $1 billion (USD) per day spent globally on climate finance, only 6% of it goes to adaptation. This represents the assignment of more value to the lives of people yet to be born than to the lives of those suffering today. All representatives, from developed and developing countries alike, should tell UN conference organizers that this approach is immoral and must be changed. Better still, adaptation and loss and damage negotiations should be removed from FCCC meetings entirely and put under the umbrella of humanitarian aid where they should have been in the first place. Then they can be handled as foreign aid issues and debated in that context. By cutting themselves loose from UN negotiations about stopping climate change, conferences that show little promise of progress, developing nations stand a far better chance of securing the assistance they need to adapt to the climate change and extreme weather threats they face now. The time has also come for nations to start withdrawing from the FCCC, which is allowed under the convention's Article 25. The idea that human activity is responsible for dangerous climate change has been debunked by thousands of peer-reviewed science papers reported on in the NIPCC's reports. The original premise of the FCCC makes even less sense now than it did in 1992. Climate change and extreme weather events have always been a constant threat to human societies and nature alike. But the proper response is to prepare for these phenomena as best we can, while continuing to fund scientific research so that someday we may be able predict what, when, and where extreme events will happen. Stopping such phenomena from occurring, the main focus of today's pointless and expensive UN FCCC meetings, is science fiction. Tom Harris is an Ottawa-based mechanical engineer and Executive Director of the International Climate Science Coalition. Madhav Khandekar is a former Research Scientist with Environment Canada. He was an Expert Reviewer for the UN’s IPCC 2007 Climate Change documents and continues to contribute to the report "Climate Change Reconsidered" (Published by the Nongovernmental International Panel on Climate Change). He has been on the Editorial Board of the Journal Natural Hazards (Kluwer, Netherlands) since 2000.